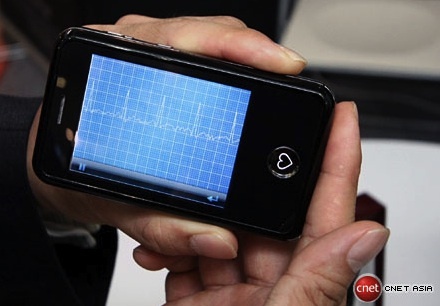 The EPI Life mobile phone is much better than the iPhone - because the EPI Life cell phone is the first handset with a built-in electrocardiogram (ECG) function linked 24 hours per day to servers monitored continuously by a team of cardiologists. It takes 30 seconds to complete a reading, which can be sent back to the firm via GPRS anywhere in the world. The collected data is analyzed by a team of 10 cardiologists round-the-clock for life-threatening conditions, and an appropriate emergency response will be rendered by its call center. This includes private ambulance service, expedited patient admission into any of its three partnering local hospitals, and on-call doctors. Alas, the EPI Life phone is only available in Singapore, Malaysia and Hong Kong for S$498 (US$361.73) for now. However, Ephone International, a Singapore firm, is offering the technology to other mobile phone manufacturers. Just imagine announcing THAT functionality at conference full of aging Apple fanboys. Are you listening, Steve Jobs? This pocket-sized ECG device plus communicator may have you thinking about Star Trek; take a look at this page with over 200 science-fictional medical technologies and tell me if you find a better reference. "Well, there's no great harm done - if you follow instructions from now on. Mine and CORA's." "CORA's?" "That isn't necessary, at least for the present... And it won't bother you unless it's needed." The doctor threw one of the numerous switches on his desk console, and a sweet mezzo-soprano voice remarked in a conversational tone: "I think you should sit down and rest for about ten minutes... Please take one of the red pills immediately... I have called the ambulance..."